Whether you're looking for a seasonal or long-term solution to protect your beach from sargassum (also known as Sargasso), seaweed, blue-green algae, or red brown tides, we have the answers you need. GEI Works manufactures seaweed boom for beach resorts, hotels, and parks to contain, exclude, or deflect sargassum, seaweed, algae, and debris before it reaches the shoreline. Floating seaweed barriers are an effective method of floating debris containment and aquatic weed and sargassum control to keep beaches clean - protecting your investment and the environment. For more information, see the Sargassum Seaweed Boom Flyer (PDF). Use either of these boom barrier solutions to successfully keep beaches clean. Depending on how and where you place your algae barrier, Orion seaweed booms can be used for aquatic weed control in one of three ways: for deflection, diversion, or containment of sargassum seaweed. Questions? We can help! Call our team at 1-772-646-0597and our specialists can help you get the clean-beach results you're looking for, or submit your specs. If you're looking for a seasonal (non-permanent) solution to keep beaches clean of sargassum, red tides, blue-green algae bloom (cyanobacteria), brown tide, or other plants and debris, the Orion Debris Boom might be your answer. Our own design and manufacturing process provides you with a floating seaweed barrier that delivers superior results, and will outlast the competitors. Calm Water, Moving Water, and Open Water models are available. If you need a long-term solution, we recommend the Permanent Seaweed Boom for floating debris or seaweed problems. Built from robust marine-grade materials, our boom is designed specifically for extended use. Permanent seaweed boom provides a strong and effective barrier to protect your beach area from floating trash or garbage, sargassum seaweed, brown or red tides, and other debris. 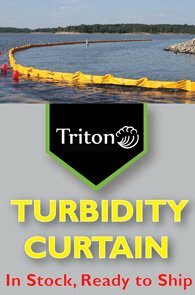 The containment boom keeps unwanted floating debris away by acting as a shield, intercepting the algae and debris before it reaches your beach. *See: Permanent Boom Spec Sheet. For any seaweed barrier or boom barrier application, proper anchoring is critical to the success of your project and to ensuring a long product life-span. Insufficient anchoring causes poor performance, and also increases wear and tear. We can help you calculate your specific loads based on the environmental conditions of your project to ensure proper anchoring. See our Sargassum Boom Best Practices for more information. We also offer on-site installation support services as an option for your seaweed boom and barriers. We can often travel (worldwide) to your site to ensure that your solution is properly installed for maximum long-term success. Located on the coast of Florida, we have a hands-on understanding of the challenges that green algae blooms, sargassum and floating debris brings. Put our experience to use for the success of your project! Dominican Republic, British Virgin Islands, Antigua, Grand Cayman, Turks & Caicos, Belize, Mexico, Florida Keys, New York, Dania Beach, as well as many other sites throughout the U.S. and the Caribbean. GEI Works proudly provides solutions that work. We understand that each situation is unique, and we want to help you find the right solution for your project. Our customer service team will work with you to identify and address any specific challenges for your project. Our goal is to provide you with the best economical, well-made and highly successful solution for your project.